Home » Resources » LCEDN Briefing Paper 2: Is there still a Role for Small Wind in Rural Electrification Programmes? Author(s): Leary J., To, L.S., Alsop, A. In the right context, Small Wind Turbines (SWTs) can offer a valuable complement to solar photovoltaics (PV) or diesel generators, offering diversity in power generation sources and the potential for local manufacture. However, the biggest challenges facing small wind are the high variability in the wind resource (in both space and time) and the high maintenance requirements of SWTs. What is more, PV prices have fallen dramatically in the last decade, resulting in the proliferation of an array of desirable and highly modular solar solutions, such as solar lanterns and Solar Home Systems (SHS). Consequently, outside of high wind regions, SWTs are now rarely directly economically competitive against solar PV. Going forward, SWTs are still likely to have a role to play, but in niche contexts and as a complimentary addition to hybridise solar PV or diesel systems, rather than as a standalone alternative. Market assessments are an essential first step to determine the relative viability of PV-wind or wind-diesel hybrid systems with PV or diesel systems in particular contexts. In favourable regions, the high maintenance requirements of SWTs can be tackled by providing stable institutional support to empower local champions, establish a decentralised maintenance network and foster the development of a local small wind industry. 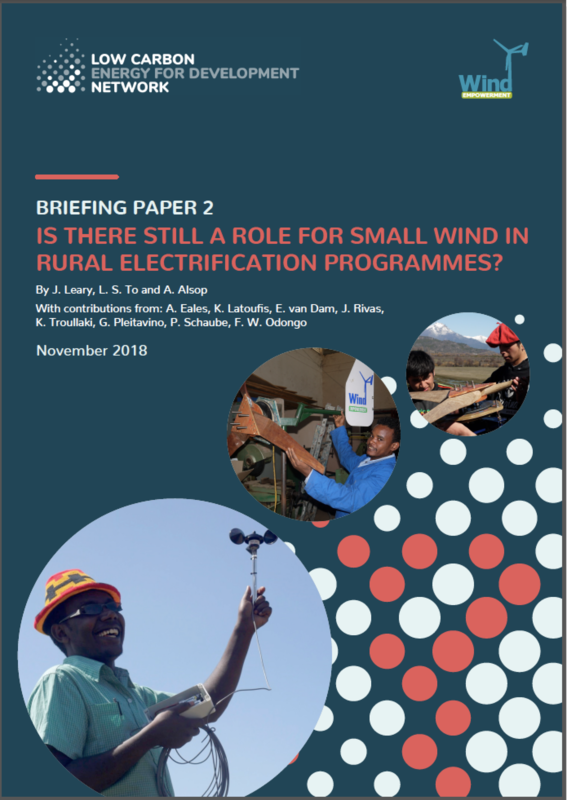 End users and local technicians should be empowered to carry out as much maintenance as they are able/willing to, especially in remote regions, where frequent long maintenance trips are likely to lead small wind electrification programmes to failure. Sustainable business models should focus on productive applications and addressing the weaknesses of diesel and/or solar generation through hybridisation.